Laurie Aberle is a full-time Personal Trainer for the Shoreview YMCA. In her four years in this role, Laurie makes sure to take the utmost care in personalizing her service to her clients and creating lasting client relationships. “Jo” has been working with Laurie for the last year through dozens of personal training sessions—cycling, in the Fitness Center and on the Pilates Reformer. 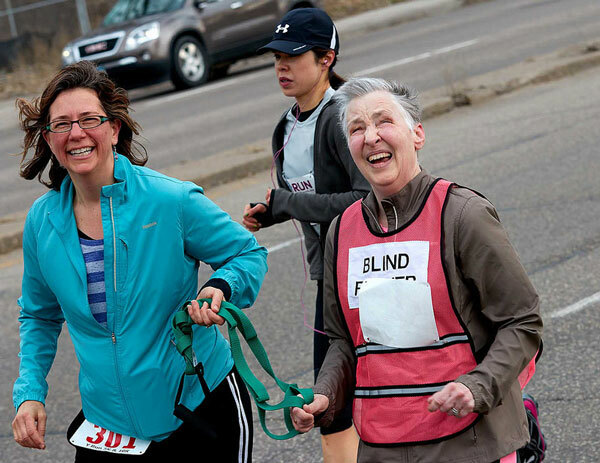 This spring, Jo and Laurie ran the Y Run 5k together and Jo finished the race with a big smile on her face. And since Jo is blind, Laurie works closely with her to ensure her needs and goals are being met. Training for the Y Run, Laurie and Jo had to develop trust to keep Jo safe, un-injured, out of the way of several hundred runners and on the race path. Laurie and Jo were, in fact, tethered together for the duration of the entire race. They practiced this tethering method time and time again during the training weeks leading to the race in order to develop the trust that was essential to Jo’s success. Thanks to Laurie’s suggestions for solid communication and needs-based training, Jo was a real winner on race day.